Dr. Arlene Baluyut is a Louisville, KY dentist utilizing the most up-to-date dental technology to improve patient comfort and provide you the smile of your dreams. Below you will find information on various pieces of advanced technology and equipment found at Signature Smiles, if you have further questions please feel free to contact us today! Cerec is a unique CAD/CAM system for patient individual all-ceramic restorations in one single appointment. The chairside 3-dementional scanning is fast, easy, and precise. 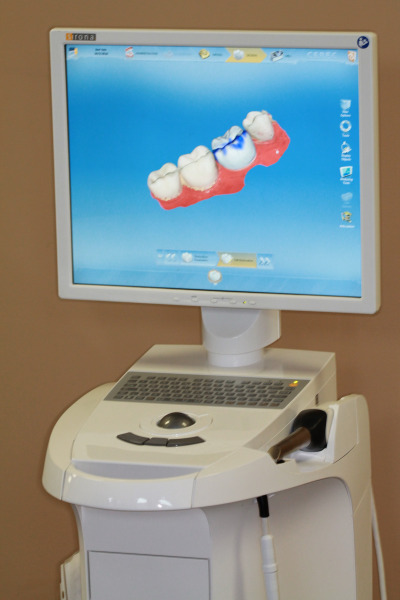 The Cerec computer allow us the fabricate the restoration specifically to your anatomy and needs. The restoration whether crown, bridge, or veneer are then milled quickly and glazed precisely to your shade specifications. The results are produced fast and seat beautifully. The intra-oral technology provides xrays at a much lower dose and delivers up to 60-80% less radiation than standard x-rays. These intra-oral cameras not only increase the dentist-patient communication, but can also aid in insurance claim reimbursement, by including color images along with traditional radiographs. Our state-of-the-art dental imaging software is used for viewing and storing dental images as well as providing patients with a preview of various treatment options. Using this software and digital images we can generate a simulation of the proposed treatment. Computer Digital Radiography (CDR) otherwise known as digital x-ray is the latest technology used to take dental x-rays. This technique uses an electronic sensor (instead of x-ray film) that captures and stores the digital image on a computer. This image can be instantly viewed and enlarged helping the dentist and dental hygienist detect problems easier. Digital x-rays reduce radiation 80-90% compared to the already low exposure of traditional dental x-rays. Removal of adherent plaque and calculus with hand instruments can also be performed on patients without periodontal disease. This treatment would then be referred to as a prophylaxis (a cleaning, although literally it means "prevention") or a prophy for short. Sometimes this device may be electric, known as an ultrasonic or sonic scaler. At present, there is inadequate research evidence to claim that periodic pre-emptive scaling reduces the incidence of periodontal disease. Two ultrasonic instruments.Sonic and ultrasonic scalers are powered by a system that causes the tip to vibrate. Sonic scalers are typically powered by an air-driven turbine. Ultrasonic scalers typically use either magnetostrictive or piezoelectric systems to create vibration. Magnetostrictive scalers use a stack of metal plates bonded to the tool tip. The stack is induced to vibrate by an external coil connected to an AC source. Many ultrasonic scalers also include a liquid output or lavage, which aids in cooling the tool during use. The lavage can also be used to deliver antimicrobial agents. An alternative to traditional rubber cup polishing that uses a pressurized spray of water mixed with a baking soda paste to clean plaque from teeth and polish them. The pressurized water removes plaque, while the baking soda acts as a combination stain remover and acid neutralizer. Recommended to clean tooth surfaces prior to bonding procedures and placement of dental sealants. Highly effective in use on patients wearing orthodontic appliances. An important piece of restorative dentistry includes achieving a smile with restorations that match the same shade and color of your natural teeth. Variable factors such as lighting, fatigue and eye sight are all reasons why dentist rely on pieces of equipment to help them accurately shade match.